If the idea of Tennessee Williams writing a supernatural gothic novel intrigues you, you will not want to miss the gorgeous, wretched beauty of Between the Devil and the Deep Blue Sea by April Genevieve Tucholke. Who is the mysterious stranger who’s renting the guest house behind Violet White’s manor? River has the sly charm of a fox, but he also has secrets he’s not telling–ones that could be Violet’s undoing. The story is strange and wild and romantic and crazy all at once, and the simmering tension beneath the languor of hot summer nights grows and grows until it becomes shrieking, wild-eyed, descent-into-madness horror. I LOVED IT. I hope you will, too. We’re very pleased to welcome the author to The Midnight Garden today as part of the official Between the Devil and the Deep Blue Sea blog tour. What better way to ring in the end of summer than this truly creepy (but also steamy!) debut? Follow along the tour as April offers insights into her characters, her writing, and bringing gothic horror back again. I asked Penguin for a font-driven cover like Leigh Bardugo’s Shadow and Bone, and they sweetly obliged. I think font-focused covers have a timeless feel. They remind me of the Gothic books I used to read as a teen–swooping letters weaving in between sea cliffs and an imposing manor and a white-dressed figure with flowing hair. Fantastic. I had temporarily titled this book “Devil River,” and then one day I was listening to some vintage jazz and heard Cab Calloway sing “Between the Devil and the Deep Blue Sea.” The tune was a bit too cheerful, but the lyrics were dead perfect. They describe Violet’s feelings toward River to a gosh darn T. The last stanza is quoted in the beginning of my book. April Genevieve Tucholke digs classic movies, redheaded villains, big kitchens, and discussing murder at the dinner table. She lives in Oregon at the edge of a forest. 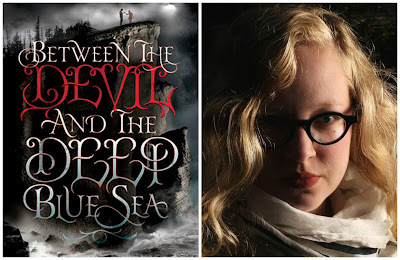 Between the Devil and the Deep Blue Sea is her first novel. Between the Devil and the Deep Blue Sea is available in stores and online now. And I have to say, I can totally imagine Violet and her brother and River listening to that song in their crumbling old mansion! Have you read this book, or are you planning to? I hope your answer is yesssss. An advance copy of this book was provided by the publisher. Next tour stop: Paranormal Fantasy Reviews. This is one of the most gorgeous covers I’ve seen! Proof that you don’t need people on covers for them to look good. I’ve been wanting to read this one forever but I’m waiting to get a ebook copy, my kindle has spoiled me. This one sounds FANTASTIC. I am having so much trouble NOT buying it right away. I’ve been pining for it for ages and ages. I LOVE the cover; it really does invoke images of the classic Gothic novels we’re familiar with! And those lyrics. Haunting! III know, this was one of my most anticipated reads of the year, and it didn’t disappoint. I hope you love it too, Molli. I think font-driven covers are some of the most effective. I also loved Shadow and Bone’s. Forgive Me, Leonard Peacock is another great one. And it’s nice to hear that Penguin listened to April’s suggestion! I know not all authors get a say in the cover process. Agreed–they’ve very eye-catching and definitely stand out in the sea of girls in dresses covers for YA. I’m glad they listened to April, too! Gosh, I LOVED this book. I loved the Gothic feel, and the family secrets and the story within the story, and the swoony romance, and the fact that River is clearly morally challenged but there are reasons and I can’t help but love him anyway. I loved the urban legends that were built-in and I loved reading about how Tucholke was inspired to write this story and where she got the title from:) Whew. Deep breath:) Clearly, I am so ready to read the sequel! The cover is certainly gorgeous. This is one that’s at the top of my wishlist. I’m planning to grab the audio. It sounds like it will be an amazing read with the right narrator! Ohh, I wonder if you’d like this, Donna! It goes pretty nuts later on in the story, and I’m hearing from people that they had a serious problem with some aspects of it. I loved it, though, so I’ll be waiting to hear what you think of it. I totally think that her cover preference was a great choice! It gives the book such a “spooky” feel, especially with the title! I had requested an ARC, but I’m too impatient! I may have to buy the hardcover. Thanks for sharing, Wendy! Yes, the font choice really does lend the book a spooky-type feel. :) The hardcover is gorgeous, so you’re probably better off with that vs. an ARC anyway. :) Thanks for stopping by! Yeah, the trailer is pretty cool; I especially like the way the title treatment is illuminated for a minute against the darkness. I’m glad you enjoyed the post, Tanja! Thanks for the nice post, I keep hearing great things about the book! I’m more and more curious. I much prefer the new title for this book and I think that song sounds perfect for it. It seems to have that eerie vibe going on that the cover represents. I think the publishers did a great job with the cover too, it’s got a great gothic feel to it. I’ve heard great things about this book, so can’t wait to get my hands on a copy. Thanks for sharing a great post with us Wendy! Agreed, the title that stuck seems both more romantic and to the point. There IS kind of an eerie vibe going on, but what’s interesting about this is that a lot of it takes place during daylight hours. An interesting way to turn things on their heads. I always thought that this cover reminded my strangely of Shadow and Bone! Looks like I’m not that nuts after all! I really can’t wait to read this one, I have been meaning to read some gothic books for quite some time. And now we know why! But in a good way, not one of those “another girl in a pretty ballgown” kind of a way. Or “we’re using the same stock photo” way, hah. I hope you like it, Mel. It may be too much for some people, hah, but I loved it. Your reference to Tennessee Williams – I saw it months ago when you’d first pubbed something to the GR feed – made me want to crack open some of the novels I’d read from him in HS… I don’t quite remember all the finer details. I wish I did so that I could think more on your comparison. I love the cover. The font-focused aspect definitely gives the book a timeless feel that I think plays really well with the old and young stream-of-time kind of feel that I got from the book. I didn’t read a lot of Gothic books as a kid, so I don’t quite know about those other covers… but this one works so well – Dial did such a fantastic job. The lyrics for the song really do work well for the book too. I liked the book and I loved her writing, but I also still can’t reconcile my feelings about the villain and Violet/River. I think River’s a fantastic character, but merrrr, the end with Violet’s realization? (Sorry, I’m trying to stay vague so it stays a non-spoiler — though maybe I already have included a spoiler?) That makes me feel so conflicted. I wanted River not to be presented as a romantic interest. The villain – this is totally spoilery, so I guess I already failed on that count. Another blogger who I discussed this book with described the villain as feeling like a diagnosis of a psychopath while River was a realized version of one. The Tennessee Williams reference is more by way of the seething tension building in a hot summer setting that erupts in madness, Christina. He’s one of my favorite playwrights, I would like to revisit some of his work myself. I know what you mean by the romance; it was hard to accept River as a romantic interest in a lot of places, but because the book sets up such a oddly dreamy/nightmarish feel, somehow I could accept that she would allow herself to be seduced in that way. That’s an interesting analysis of the villain/River, too. I’ll have to think about that when I go back throug it at some point. I am really excited to read this! I hope you get a chance to soon, Belle! I’ve been wondering about this book. Regrettably, I’ve heard mixed things about it. But you know me, I adore horror — particularly Gothic horror — so I’m going to give this book a try anyway. The cover caught my attention right away. I agree that font focused covers do seem to be timeless. They just give you so much to imagine, whereas a cover with a person on it can take away your ability to imagine what the characters are like. No mixed feelings from me, Kim! I looooved this, I feel like you might, too. I hope so, anyway. What a fabulous guest post, and recommendation, Wendy. I love the story behind the cover, and agree that the font-driven cover was the way to go! I’m glad you enjoyed the post, Andrea, it was fun for us to hear the story behind the cover and title, too. Thanks for stopping by! I loved the cover — and the story inside. And I did look up the lyrics of the song. I had never actually heard the song before, isn’t that funny? I really liked it, though, I’ll have to get a copy. I’ll think of Violet in her sad, big house every time. I didn’t realize you got a say in your cover-that’s so cool that they obliged and really outdid themselves with this gorgeous cover! I don’t think this is all that common, Bookworm, but I’m really glad they listened to her opinion in this case! It’s such an eye-catching cover. I THINK you did. ;) I’m glad you loved it, too! The cover is gorgeous and seems to match quite well to the synopsis. Good to hear the author got to collaborate on the final look. Hah, this is VERY much a Wendy book. :) Fall really is more Gothic-like, isn’t it? But this one has a bit of a summer gothic feel, though that’s nice to read when it’s cooler, too. I’m in love with this book! And I’m so glad she requested the font based cover and it’s great that they LISTENED! I think this cover matches the story perfectly as well as the title. Love it all! I love it, too! I am so glad they listened to her, because I agree, it definitely suits the elegant, over-the-top nature of the story. I think the request for a font-focused cover was a great choice! It adds to the intrigue and the old, gothic feel of the book overall. Such a great story. Agreed, it suits the story beautifully. :) I examined it pretty closely when it first arrived. This is a fantastic book, but um…this is NOT a Waiting on Wednesday post. Not sure what made you think it was. I’m so excited to read this! I’m expecting my copy in the mail (STILL!! ), so I’m looking forward to checking this out. I also ADORE this cover! It’s so eye-catching and utterly gorgeous. Thanks for sharing, Wendy! Eeeee, I hope you love it, Keertana! It’s so freaking weird, hah. I just HAD to buy this last week. Usually I try to wait until it comes in paperback but I couldn’t! I can’t wait to read it. I’m loving all these YA gothic novels that are out this fall/ this year. It’s amazing! I’m glad you got yourself a copy, Diamond! I actually usually prefer paperbacks as well (space issue, plus easier to read), but the hardback for this one is gorgeous. Really happy that we’re seeing more YA gothics, too. I love that the publisher took your opinion into account. :) It’s a striking cover. She’s pretty lucky they did. ;) Turned out beautifully! I am reading this now and it is AMAZING!!!!!!!! I am just completely hooked! I love the April Tucholke’s writing style!! and the scenery?? OMG YES! Creepy yet fantastic!!! I cannot wait to finish it and see what happens! Isn’t it gorgeous? So strange and beautiful at the same time. I LOVE the setting with Citizen Kane as well. That song is definitely a bit too upbeat for the book when you listen to it, but it does fit so well. I really loved this one. Yay! I adored it, I’m glad you did too, Savy. And there’d better be a second book, I need to know what happens next!